SUPER SOFT LUXURIOUS MICROFIBER – The Chic Home Duke oversized comforter is made with premium quality durable engineered microfiber cotton feel fabric – No more rustling and crinkling as you toss and turn to get comfortable. Just quiet peaceful sleep with an amazingly soft comforter cover. HYPOALLERGENIC DOWN ALTERNATIVE FILLING – The Duke pieced comforter is stuffed with 100% hypoallergenic synthetic filling – Perfect for anyone with allergies looking to breathe and sleep easy. 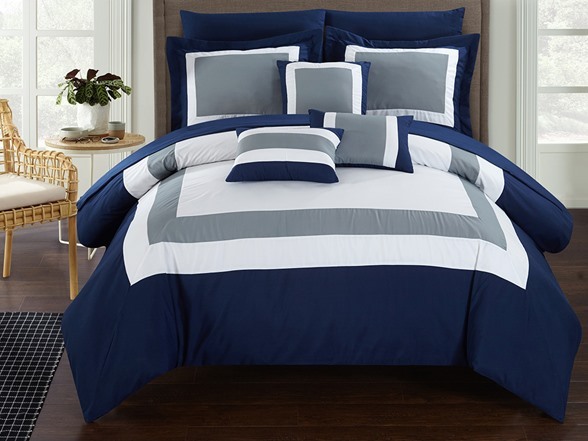 A BED SET BUILT TO LAST – The Chic Home Duke King comforter set is made with strict quality control standards and comes with everything you need for a bedding makeover. With a king size comforter, sheet set, decorative pillows and shams, this set is all you need to transform your décor and elevate your style.